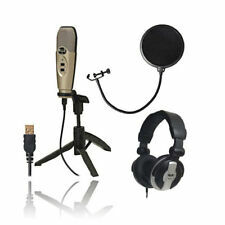 "Make anyplace your professional recording space. 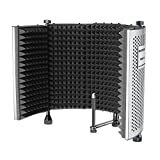 This portable sound absorbing vocal recording panel from LyxPro instantly creates an essential microphone booth with the perfect ambiance for all your professional or amateur live performance recordings. The panel is easy to assemble and use, and is perfect for deflecting noise interference for top-notch vocal recording, anywhere. Eliminates Noise InterferenceDesigned by acoustic experts to absorb and deflect ambient noise that may compromise the accuracy of your performance capture, the panel effectively blocks sound from air conditioners, audience chatter, and other obstructions. Reduces BouncebackThe panel is constructed from premium aluminum and lined with high-quality foam. This delivers structural integrity along with appropriate sound diffusion so your recording is always free of distortion or alteration due to surrounding waves. Sets Up in SecondsEasy-to-follow instructions guide you through the truly minimal assembly required.Setting up the VRI-30 entails no more than unfolding the panel?s hinged sections, hand-tightening the locks, and positioning the microphone to your preference. Remains Solid & StableThe recording panel mounts to your microphone stand with a convenient adapter. The included mounting hardware set adds incredibly versatility, allowing you to freely maneuver your equipment around the recording space as needed. Travels ConvenientlyThe clever panel design allows for easy breakdown for travel. To take your perfect recording environment anywhere, take apart the sections and pack them flat in your suitcase or musician?s bag. Reassembly is equally painless." 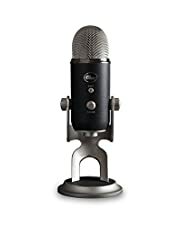 Reduces Unwanted Noise & Room Ambience to Create Optimal Recording Conditions AnywhereAluminum & Foam Panels Position Easily Behind Microphone for Effortless SetupStand Mount or Desktop UseAdjustable Panels, Non Slip Feet for Desktop Use1-Year Full WarrantyMake anyplace your professional recording space. 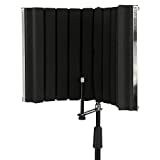 This portable sound absorbing vocal recording panel from LyxPro instantly creates an essential microphone booth with the perfect ambiance for all your professional or amateur live performance recordings. Since even high-quality professional microphones can be rendered useless in less-than-stellar recording environments, this panel helps you ensure crisp, dry sound – no matter where you go.Eliminates Noise InterferenceDesigned by acoustic experts to absorb and deflect ambient noise that may compromise the accuracy of your performance capture, the panel effectively blocks sound from air conditioners, audience chatter, and other obstructions.Reduces BouncebackThe panel is constructed from premium aluminum and lined with high-quality foam. This delivers structural integrity along with appropriate sound diffusion so your recording is always free of distortion or alteration due to surrounding waves.Sets Up in SecondsEasy-to-follow instructions guide you through the truly minimal assembly required. Setting up the VRI-10 entails no more than unfolding the panel’s hinged sections, hand-tightening the locks, and positioning the microphone to your preference.Remains Solid & StableStability feet prevent sliding, and the entire booth mounts to your microphone stand with a sturdy clamp system. A microphone mounting hardware set is also included, providing extra protection and stability when used in desktop mode.Travels ConvenientlyThe clever panel design allows for easy breakdown for travel. To take your perfect recording environment anywhere, take apart the sections and pack them flat in your suitcase or musician’s bag. Reassembly is equally painless. "Make a Great Recording in the Comfort of Your Home The VRI-20 from LyxPro is an ABSORBING PANEL equipped with HIGH DENSITY ACOUSTIC FOAM that absorbs the voice and prevent it from getting bounced around the walls or other surfaces which usually creates unwanted echo or reverb. This is very critical when recording in a room that is not treated well or not treated at all which results in the recording being different than what was imagined and those things cannot be fixed at the post process. Get More Control On How the Vocal or Instrument Should SoundThe VRI-20 will help you get more control on how the vocal or instrument should sound like by SUBSTANTIALLY REDUCING the extra ECHO or REVERB which will result in a drier sound, then the person who is doing the editing in the post process will have much more freedom to add and reduce effects without effecting the original recording. 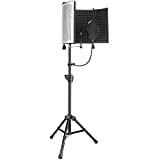 Portable and Easy To Set UpThe VRI-20 is very convenient in a portable situation, it's easy to set up, mounts on most standard microphone stands and includes all the mounting hardware needed. 1-Year WarrantyThe VRI-20 comes with a limited 1 year warranty"
Reduces Room Ambience to Create Optimal Recording Conditions Anywhere. Eliminates Audio Wave Bounceback & Interference to Deliver Dry, Clear Sound. Aluminum & Foam Panels Position Easily Behind Microphone for Effortless Setup. Included Mounting Hardware Supports Recording Equipment for Added Safety. Measures 19.25" x 12" x 3.5"; Weighs 3.7 Pounds; Easily Disassembles for Transport. Make anyplace your professional recording space. This portable sound absorbing vocal recording panel from LyxPro instantly creates an essential microphone booth with the perfect ambiance for all your professional or amateur live performance recordings. The panel is easy to assemble and use, and is perfect for deflecting noise interference for top-notch vocal recording, anywhere. Eliminates Noise InterferenceDesigned by acoustic experts to absorb and deflect ambient noise that may compromise the accuracy of your performance capture, the panel effectively blocks sound from air conditioners, audience chatter, and other obstructions. 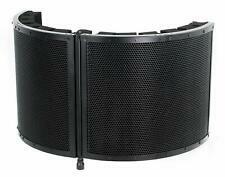 Reduces BouncebackThe panel is constructed from premium aluminum and lined with high-quality foam. This delivers structural integrity along with appropriate sound diffusion so your recording is always free of distortion or alteration due to surrounding waves. Sets Up in SecondsEasy-to-follow instructions guide you through the truly minimal assembly required.Setting up the VRI-30 entails no more than unfolding the panel's hinged sections, hand-tightening the locks, and positioning the microphone to your preference. Remains Solid & StableThe recording panel mounts to your microphone stand with a convenient adapter. The included mounting hardware set adds incredibly versatility, allowing you to freely maneuver your equipment around the recording space as needed. Travels ConvenientlyThe clever panel design allows for easy breakdown for travel. To take your perfect recording environment anywhere, take apart the sections and pack them flat in your suitcase or musician's bag. Reassembly is equally painless. Reduces Unwanted Noise & Room Ambience to Create Optimal Recording Conditions Anywhere. Stand Mount or Desktop Use. Adjustable Panels, Non Slip Feet for Desktop Use. Make anyplace your professional recording space. This portable sound absorbing vocal recording panel from LyxPro instantly creates an essential microphone booth with the perfect ambiance for all your professional or amateur live performance recordings. Since even high-quality professional microphones can be rendered useless in less-than-stellar recording environments, this panel helps you ensure crisp, dry sound - no matter where you go. Eliminates Noise InterferenceDesigned by acoustic experts to absorb and deflect ambient noise that may compromise the accuracy of your performance capture, the panel effectively blocks sound from air conditioners, audience chatter, and other obstructions. Reduces BouncebackThe panel is constructed from premium aluminum and lined with high-quality foam. This delivers structural integrity along with appropriate sound diffusion so your recording is always free of distortion or alteration due to surrounding waves. Sets Up in SecondsEasy-to-follow instructions guide you through the truly minimal assembly required. Setting up the VRI-10 entails no more than unfolding the panel's hinged sections, hand-tightening the locks, and positioning the microphone to your preference. Remains Solid & StableStability feet prevent sliding, and the entire booth mounts to your microphone stand with a sturdy clamp system. A microphone mounting hardware set is also included, providing extra protection and stability when used in desktop mode. Travels ConvenientlyThe clever panel design allows for easy breakdown for travel. To take your perfect recording environment anywhere, take apart the sections and pack them flat in your suitcase or musician's bag. Reassembly is equally painless. Eliminates Noise Interference: Used to reduce ambient noise, create a closer, drier, more controlled vocal or instrument recording in many situations. 5-Panel Design: 3 stationary center panels and 2 foldable end panels; Easy to pack and carry around. Sturdy aluminum construction; High-density sound absorbing foam; Adjustable knobs to tight the panel closely on the stand. Can be mounted on stand, susceptible to install and stable; Detachable stability feet, allow the panel to be placed on desk steadily. Non-slip Stability Feet: Prevent sliding, and the entire booth mounts to your microphone stand with a sturdy clamp system. 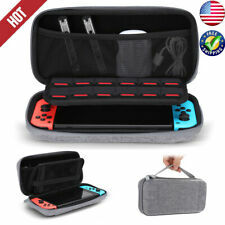 A microphone mounting hardware set is also included, providing extra protection and stability when used in desktop mode; Note: The microphone, stand and headphone are not included. MINI RECORDING BOOTH - Creates clean audio for home recording studios, podcasts or YouTube recordings, music recordings, and more. 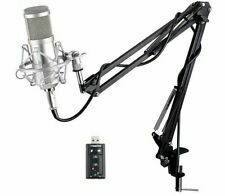 The size is easily adjustable to accommodate a majority of recording environments. ELIMINATES NOISE INTERFERENCE - Designed to effectively block sound from air conditioners, audience chatter, and other obstructions. TRAVELS CONVENIENTLY - Compact, lightweight, and simple to fold up, making it conveniently portable and easy to store. SET UP IN SECONDS - Assembly is fast and easy and we provide all the necessary hardware and instructions. WE'VE GOT YOU COVERED - This product is backed with a 1-Year Manufacturer Warranty and friendly tech support to help with any questions or concerns.. 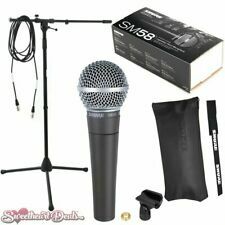 Kit Includes: (1) NW-5 Microphone Isolation Shield Panel (Silver and Black), (1) Adjustable Wind Screen Bracket Stand with Aluminum Tube, (1) 6 inches Pop Filter with Hose and Metal Clamp. Great for Professional Vocal/Acoustic Recording and Podcasting Sound Booth to record clear vocal. 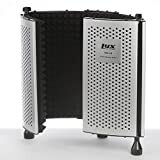 NW-5 Microphone Isolation Shield with 5-Panel Design: 3 stationary center panels and 2 foldable end panels; Sturdy aluminum construction; High-density sound absorbing foam; Adjustable knobs to tight the panel closely on the stand. Pop Filter: Double Layer Mesh Screen can demolish problematic plosives and avoid distortion to provide a clean and professional recording. Flexible Sturdy Hose made of high-strength metal can hold the screen steadily for long time positioning. Wind Screen Bracket Stand: Made of sturdy aluminum and stable tripod design, heavy duty, with non-slip feet; Adjustable height (39.4-65.2 inches/ 100-165.5 centimeters) for common use. Standard 5/8-inch thread mount can be directly plugged into the socket of the acoustic isolation shield. Note: Microphone, shock mount, cable and headphones are not included. DUAL FOLDING SOUNDPROOFING: The folding diffusion shell is a curved metal plates with small holes designed to redirect unwanted audio. While the foam absorption lining are lined with high quality foam used to absorb the source reflecting audio waves.STUDIO QUALITY: Unwanted audio ambience may be generated unexpectedly. But, Pyle vocal booth foam offers high density deflection noise absorbing foam tiles that has an acoustic foam panel thickness for about 2.0â€™â€™ inch to record studio quality music.ELIMINATES NOISE INTERFERENCE: Shield used to reduce ambient noise, create a closer, drier, more controlled vocal or instrument recording in many situations. 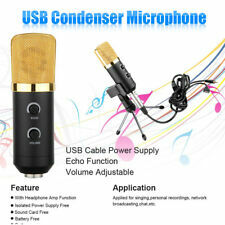 Also, it helps you achieve isolated vocals in small home studios and untreated environments.ADJUSTABLE MICROPHONE DEPTH: Compact with reflection filter to achieve vertical mounting only making it the perfect solution for vocal recording. 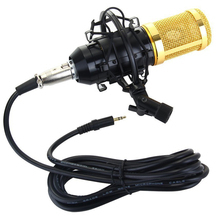 It can be adjusted ranging from 1â€ to 5â€ that can fit universal standard 5/8â€ microphone threading.USED FOR PROFESSIONAL AND AMATEUR: Regardless if youâ€™re pro or an aspirant, with this superb setup you'll be equipped to record clear, focused natural sound of your voice, even in a room with imperfect acoustics. Get ready to record and be a star!